1. Preheat oven to 210 degree Celsius. Line muffin tin with muffin liners. Set aside. 2. In a large bowl, sift together flour, baking powder & salt. Set aside. 3. In the mixer bowl, whisk together eggs and sugar at medium speed until combined. Mix in yogurt, oil, and vanilla till well combined. Mixture will be very runny. 4. Make a well in the middle of the flour mixture from step 2 & slowly pour in the wet ingredients into the dry ingredients. 5. Gently fold everything together using a wooden spoon or spatula. About 10 folds later, add in the blueberries & continue gently folding for another 10 to 12 folds. To avoid overmixing, ensure you fold gently until there are no big pockets of flour remaining. Small specks of flour all over the batter is fine. Note : The batter will be very thick and lumpy. 6. Using a dessert spoon or cookie batter ice cream scoop, scoop the batter into the prepared muffin liners, filling all the way to the top. 7. Bake at 210 degrees Celsius for the 1st 5 minutes then reduce oven temperature to 190 deg and continue to bake for abt 20-25min until the tops are golden and skewer comes out clean. 8. 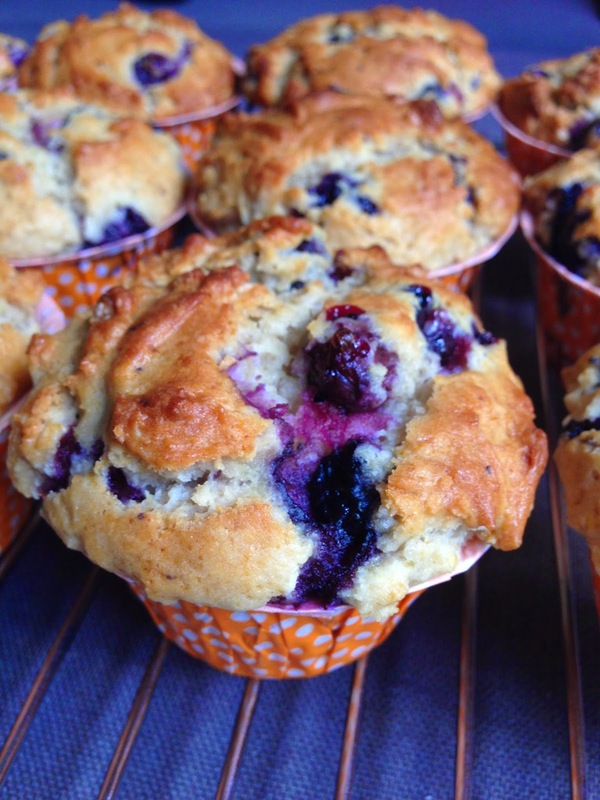 Allow muffins to cool for 10 minutes in the pan before chomping on the muffins! Crunchy muffin tops taste best on the day of baking but will soften thereafter.